I’ve always been fascinated by films done on shoestring budgets, and how creative people can manage to shine despite wearing restrictive shackles. Due to its minimalistic nature, George Batchelor’s Far From Noise reminds me a lot of those films. Featuring little action, and zero changes of scenery, the game takes place entirely on the edge of a cliff, where a car is dangerously balancing upon. The player is stuck inside the car all alone, and an engine failure caused the precarious position they’re in. The gameplay of Far From Noise is solely comprised of making dialogue choices. Since you’re alone, this results in a whole lot of talking to yourself. As one would expect from a game about a person’s potential final moments, there’s a lot of self-reflection that occurs. While the story stays largely the same no matter what your choices are, there are small moments that really help shape the player character. From naming your car (mine was Laura) to filling out your character’s background, players are able to feel as if they crafted some part of a narrative, even if they’re just ultimately picking a bunch of pre-written phrases. This sort of connection makes the story feel all the more personal, and I wound up feeling legitimate worry whenever I saw the car tilting too close to the ocean. So much of Far From Noise is grounded in reality. From regrets of not chasing after dreams to allowing mistakes to determine your life, a lot of the subject matter can be quite depressing. However, there’s also a light of hope in all of these conversations. Hope that both the main character and the player will learn something from this experience, and that they’ll be changed for the better due to it. 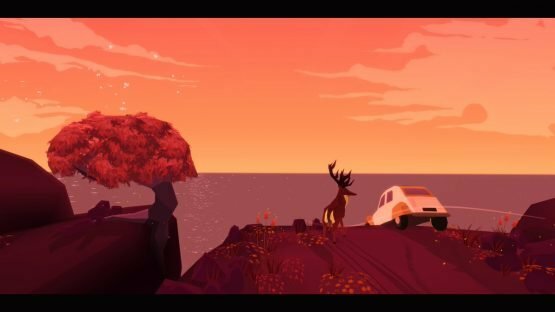 The personal themes of the game are really highlighted when things eventually get weird, and the player begins talking to a male deer that wanders onto the cliff. Has the isolation of being stuck in the car caused the character to hallucinate an otherwordly experience? Are they even alive? These are all questions that players are invited to ask, but an answer is never given. A lot of the focus may be on interpretation here, but Far From Noise manages to aid that with some excellent pacing. Like a real conversation, there are pauses and breaks between topics. The game takes these moments to gradually change the game from day to night, and there are some awe-inspiring moments of just looking at the view. 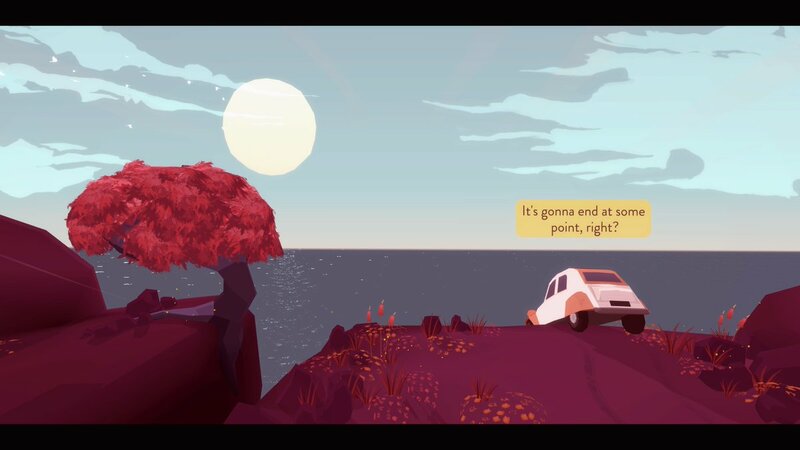 The car rocks back-and-forth as time passes, and it really underscores how the player seemingly has all the time in the world while being stuck despite the fact that it might also be their last moment. Throughout its three or so hours, Far From Noise tackles a lot of subjects that wound up hitting close to home. Days after completing the game, I’m still thinking about the conversation regarding the difference between being alone and lonely. The writing may only skim these topics, rather than focusing on them at length, but it does so with such elegance that it’s able to really embed itself in the player’s mind. Ultimately, the player’s own thoughts will shape a lot of the enjoyment in Far From Noise. This is most evident from the game’s brilliant ending that’s quite open to interpretation. It perfectly encapsulate’s the title’s “less is more” attitude, and I found myself staring at the beautiful cliffside view for almost 10 minutes after the game had ended. Just reflecting on the journey I had just been on. Far From Noise is an important showcase that games should work within their limitations. A single developer like George Batchelor can never make something that’ll rival Uncharted in scope or scale, but here he’s managed to work within boundaries to make something all the more profound. Smart writing and design can go a long way, and Far From Noise manages to go many places while never leaving the edge of a cliff. Far From Noise review code provided by publisher. 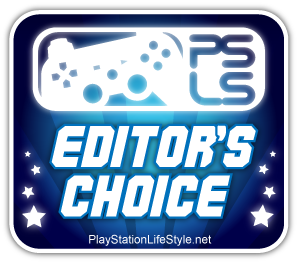 Version 1.00 reviewed on PlayStation 4 Pro. For more information on scoring, please read our Review Policy here.